The Tuesday bird walk stopped at the Brant Viewing Area in Qualicum Beach on our way to the Little Qualicum River Fish Hatchery north of Qualicum Beach. The morning was cloudy with calm winds. We estimated that we could see over twenty thousand Surf Scoters, White-winged Scoters, Black Scoters, Brant, Lesser Scaup and Greater Scaup on the Strait from the Brant viewing area. A large raft of Long-tailed Ducks and Western Grebes were seen further off shore. Black Turnstones and Black-bellied Plovers were resting along the shoreline. There were two American Dippers on the Little Qualicum River at the fish hatchery. Varied Thrush and American Robins entertained us with their singing all morning. 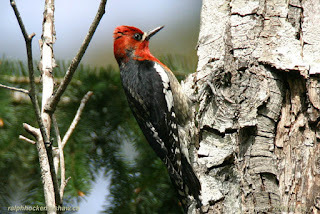 Red-breasted Sapsuckers were seen feeding from tree sap just off the trail. Several Yellow-rumped Warblers were seen not far from the trail. We spotted six Bald Eagles circling high above us. 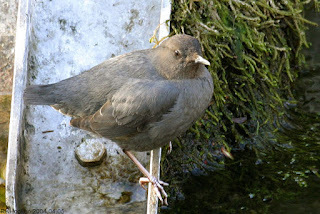 American Dipper: Ralph Hocken Photo. The Tuesday Bird Walk on March 27, 2018 will be going to the Little Qualicum River Estuary. Meet at the Parksville Community Park (near the Lions Club playground parking lot) in Parksville at 9:00 am, or at the Brant viewing platform in north Qualicum Beach at about 9:20 am. The Sunday Bird Walk on Marsh 25, 2018 will be going to the Bowen Park in Nanaimo. Meet at the Bird store at 9:00 AM., or the main parking lot off Bowen Road at Bowen Park near the bowling green of at about 9:20AM.